A study of the method of loci, entitled “Mnemonic Training Reshapes Brain Networks to Support Superior Memory” published in the March 2017 issue of Neuron by scientists at Stanford University, the Max Planck Institute of Psychiatry, and the Donders Institute shows the effectiveness of mnemonic training, specifically the method of loci, which results in significant recall improvement across time periods of twenty minutes, one day, and four months. 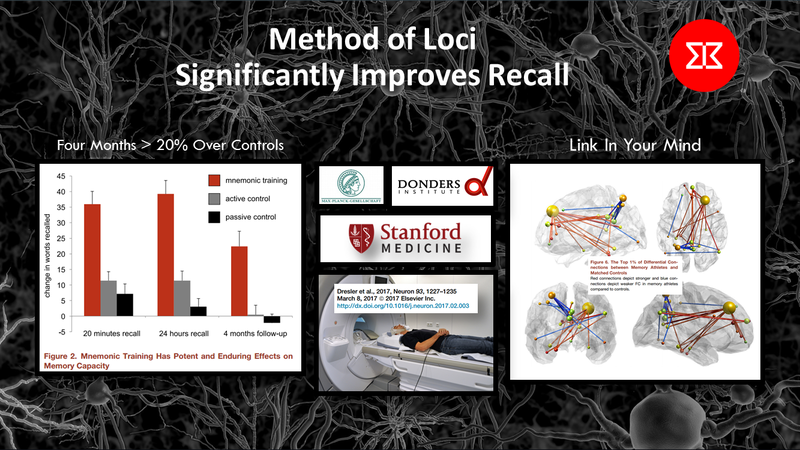 Even after four months, the group using the method of loci had more than a 20% level of improvement in recall over the active and passive control groups. The study included using functional magnetic resonance imaging (fMRI) of the subjects, testing their recall of words, and then comparing their before and after MRIs with memory athletes. They found the method of loci subject’s connections across brain centers came to resemble the memory athlete’s. In their study they show with a figure of the brain’s MRI connections the noticeable difference in connections between memory athletes and controls and indicate this improvement from using the method of loci may result from improved connections (links) across brain areas. 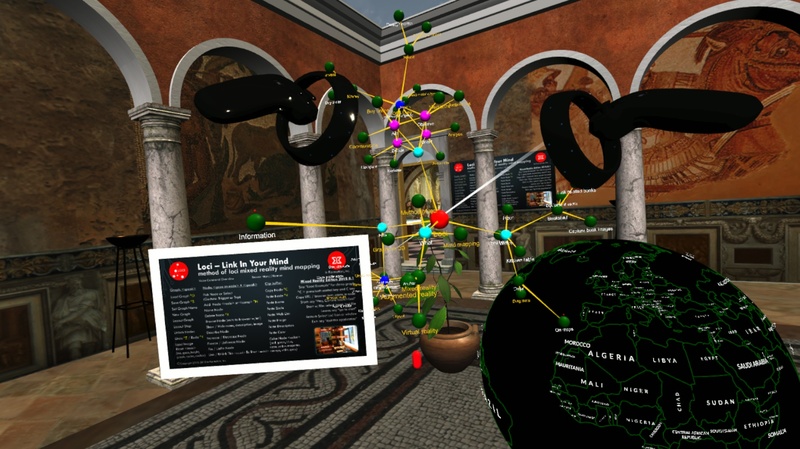 This study does not include AR or VR elements, but it does emphasize the use of the method of loci, where mental images of locations are used to recall items. In our Loci software, we functionally support placing objects in places for later recall consistent with the method of loci. From 31 May to 2 June the Augmented World Expo was held at the Santa Clara Convention center. There were a lot of interesting things there, and we are providing some notes here. 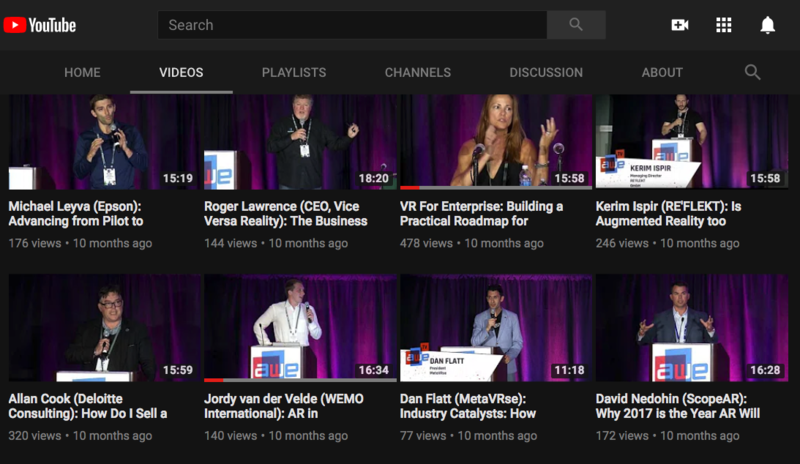 Videos of AWE 2017 talks are available on the AWE page on Youtube. Of course, we think one interesting thing was our booth 359 showing off our new product, Loci, available for HoloLens now in the windows store. We showed visitors how their notes, ideas, and analysis can be placed in the real world, to increase understanding and recall as they solve their problems. Congratulations to Microsoft HoloLens for winning the Best Headworn Device award, as selected by the IEEE Standards Association! I liked the talk by Tony Parisi of Unity. Tony worked in the early days of VR, on the VRML standard. Two billion devices have unity player installed. He gives a good survey of what is going on across companies in mixed reality. Mentioned WebAR, with the world as your QR code.